The expansion plans of Ocean Beach’s largest employer, the famous OB People’s Organic Food Market, have been placed on hold due to the unfortunate and untimely death of “Tiny”, the owner of Tiny’s Tavern. The market co-op, which is a mainstay on Voltaire Street in OB, has just recently purchased the two parcels of land directly to the store’s east, one containing a duplex and the other containing Tiny’s Tavern. And part of the store’s expansion plans were based on an agreement with “Tiny” who was on the verge of retiring from operating his bar and small grill. “Tiny” – the nickname of Alan Kajiwara – had planned to use the land sale to the co-op as a push for him to move back to Hawaii where he has family, but his fatal stroke at the age of 54 ended all that. And as Nancy Casady, the co-op’s CEO, told me this morning in an exclusive interview, the store is “cooling our jets” in deference to Tiny’s family and to Dara, Tiny’s minority partner at the bar. “We’re in a holding pattern,” she said, “until the conditions and status of the bar are settled.” The store certainly does not wish to unsettle Tiny’s family or crowd more than they already are due to his death. Apparently, Tiny’s brother had also just recently passed away. In a phone interview, Casady explained the co-op has been looking at expansion options for 3 years now. The current parking situation at the store is a challenge to their customers coming in – and always has been a problem since its beginnings as one of the very first organic vegetarian stores in San Diego. “The co-op has investigated more than a dozen potential locations,” Nancy told me, over the years. And for various reasons, they were all “unworkable”. But at a recent board retreat, she said, “one of our board members raised the question of ‘why don’t we double-down in OB? 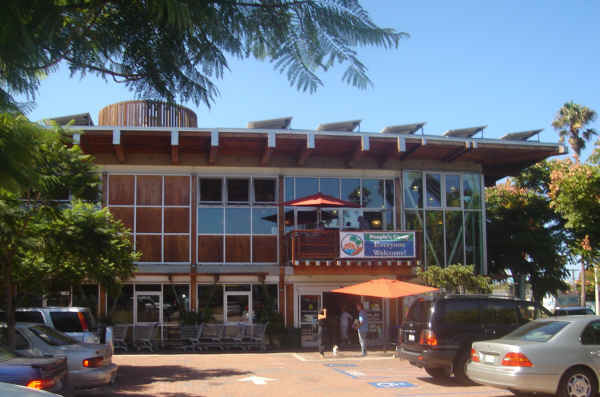 '” Afterall, the co-op owes its success to Ocean Beach, and has built a strong relationship with the community over the decades, giving back, employing locals, providing a cultural and meeting center. This idea resonated with Nancy and the staff and they moved on it. Besides more parking, the co-op has wanted to open a sit-down vegetarian restaurant, which is one of their main goals. It’s truth, Nancy said, there is a vegan take-out upstairs currently at the store, but a restaurant is a different dining service. “We also want to open up a juice bar as part of the restaurant,” she added. These ideas gained momentum. And the ideas turned into reality. The co-op purchased both lots next door to its east, each 50 x 100 plots. And the lot with Tiny’s Tavern closed on January 5, this year. The day after it closed, Tiny passed away. Nancy told me that the original agreement the store had with Tiny was that he was going to operate the bar for another year, and then transition in February 2016, enabling him to wind his business down. In the meantime, the co-op was going to just sit on it all. Tiny had plans to move back to Hawaii to be with his family. The original plan, Nancy said, was to take over ownership of the lots by February 2015, and have architects and planners review the conditions of the 2 parcels and come up with options for the store that include the sit-down restaurant and more parking, using the duplex and Tiny’s Tavern parcels in some configuration. (The current upstairs vegan take-out would be kept.) The plans and options will not necessarily call for the demolition of the buildings. 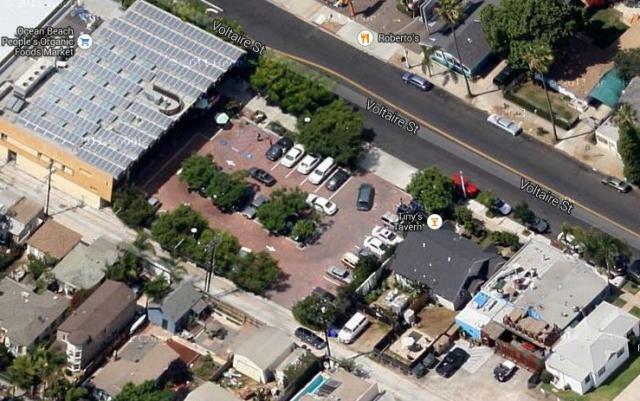 Google map view of People’s co-op, the large building on the left, and the 2 parcels next door to its parking area. Since Tiny’s death, the co-op has been working with Dara. It’s Nancy’s understanding that she plans to continue operating the bar until Tiny’s estate gets settled. RIP Tiny, always was a great man to be around even though I didn’t know him personally. Nice to read that people had a nice friendly agreement, and are being considerate even after the death of one of the parties. No lawsuits, no fighting, everyone was on the same page and helping each other out. I think that says a lot about Tiny as a person and about OB People’s Market as people as well. Sad that there had to be a death involved in all of this because it sounded like a happy ending for all parties. I’m happy that the Co-op is holding off for a bit. If I had the money I would buy Tiny’s to keep it going in his name. He was a special treasure to me and this town. Peoples should have bought Apple tree? Big lot and parking? I don’t think the Apple Tree building was sold, I believe that CVS is leasing it. An additional point is that when the current People’s store was designed and built, it was built to high energy conservation and sustainability (before that word became ‘current’) standards. Why would they move into such an old building even if Apple Tree (previously a Safeway, I think) was available to them. I highly doubt that the Co-op would want anything to do with the Apple Tree building. Remember that Apple Tree’s lease was not renewed. People’s would never move into a building that a local grocery store was just kicked out off. I doubt that had anything to do with their decision. It was probably the astronomical rent. They are in the business of owning their property it seems, anyway. If the Market admits to the parking problem from the beginning why did they ask and get from the City an approval to provide NO parking for the community events they offer. They obviously care more about making money than the safety of the customers trying to squeeze into their parking lot or the stress it causes, if you haven’t witnessed the verbal exchanges of customers over parking spaces you’ve missed the irony of the Market’s philosophy. Oh, can you please have the market employees smoke their cancerous cig’s away from the path of customers who have to inhale it as they leave through the alley. I assume you’re referring to People’s? I don’t recall ever hearing that store referred to by the generic term Market… At any rate, there is NEVER enough parking anywhere to meet the desires of many drivers who want to park as close as possible. To extrapolate to People’s caring only about money and not about the “stress” for customers wanting a parking space in the lot is ridiculous. Certainly there are some people who need to park close to the entry, that’s what handicapped spaces are about. Perhaps there could be more than there are (I don’t know how many there are) but to expect to meet everyone’s parking expectations is impossible! As for the rude exchanges between drivers over parking spaces, that’s their problem and not People’s. It’s not the fault of People’s that some people are so volatile. So, you don’t get a parking space you were headed for… go around or go park on the street! I’ve never had trouble finding a space on Voltaire within that block and walking, myself. People’s should lower their prices and focus on making natural foods more accessible, rather than making a ton of $ to pay off the new building debt (during a period when interest rates are extremely low) and raking in $ to buy more property. What happened to the store that was for the people and not the profit? Just my opinion. What is the alternative? Go shop at Whole Foods and find out what an expensive profit-motivated natural food store looks like. Sounds like you’re accusing the Co-op of being greedy, which is absurd. They are a co-op that started over 40 years ago and accrued funds to grow and expand after decades of cooperative planning. Their plan was based on annual agreements voted by members annually. They offer the best quality, most sustainable food and products at the best comparable prices, treat their employees fairly, more than any other market in the region. I am proud to be a member for over 5 years, have friends who work there. I absolutely love People’s and am totally grateful to them . It’s one of my favorite aspects of OB. Looks like Appletree will be reopening on Newport this summer. I look forward to their return. Did anyone hear… rumor??? or not??? that People’s evicted Tiny’s partner before the agreed upon date of next year for closing. Raised the rent and then refused to accept a check for April’s rent. Anyone know the truth.